Thanks Dwayne! For the comment and for the prayers! Bless your heart! I so understand about having people in your house. I struggle with that too! You sound like a fabulous person who really tries to do what God wants. We all struggle to follow through. Keep up the great posts! I enjoy reading them and have sent up a prayer for you and your family! Blessings! I’m so glad you’re here reading 🙂 And good to know I’m not alone. Thanks always for the prayers! Great post! Thanks for sharing – I’m guessing a lot of missionary couples will be able to relate! Thanks Jim. 🙂 Yeah, I have a feeling I’m not the only one with this experience, whether living overseas or not. . .
Elizabeth well done on capturing the nuances of ministry marriage dance! I had a deep learning curve as youth pastors wife which gave me a foundation to recognize and then work off of in missions. After 20 years. of practice I still struggle in some set ups and scenerios! Ive been isolated in much of this and your wrightings. are a gift to me. Others in the same situation help me think outside the box. thank you for investing in missionaries all over the world. I confess it’s still hard for me to think outside the box! I can do it, but it’s not my first inclination. 🙂 And I echo your experiences, serving in youth ministry was such a good foundation for mission work. So glad you stopped by today, and so glad you were encouraged — or rather, so glad we can encourage each other in these things! Well written! My husband and I also served in youth ministries in different churches, but never encountered a “trash your house” test. I am very proud of you and how you handled that because it could have gotten VERY ugly. I wish my kids could have been a part of your youth ministry. They would not ever trash your home. I am a victim of church hurt yesterday and my kids got up today and cleaned the house, vacuum, dishes, the laundry. I was speechless. I am telling you to say that youth do get what you are teaching them even if it doesn’t seem like you are getting across. Sometimes letting them see your “human side” is what it takes for them to get into gear and “pitch in”. 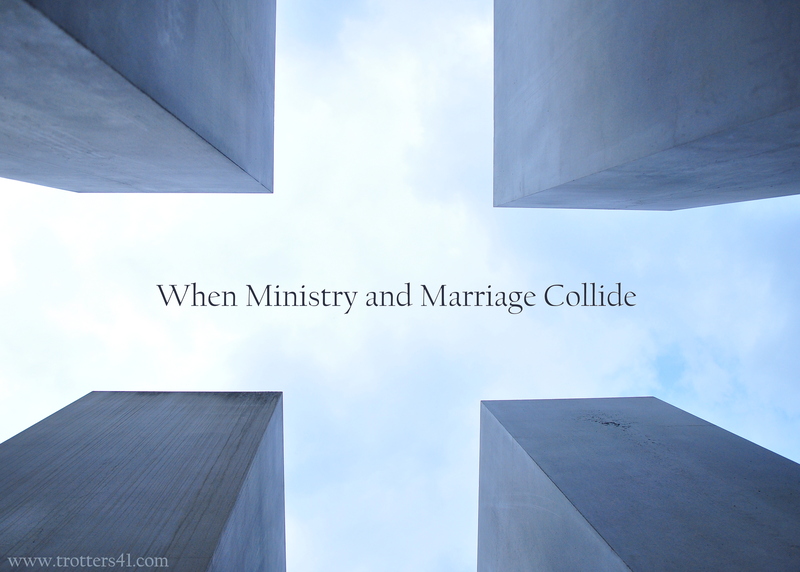 I went to your site because I am also wondering what happens when a marriage goes head to head with ministry. The husband will drop everything (including you) to be at prayer meeting, bible study, sunday school, and leaves you in the dust (or the ashes) as the case may be. Your article was right on time. God bless you and your family. I am writing this now as my husband and kids just left for vacation bible school.] that he is teaching this It’s just me and the baby. I had decided to take a sabbatical from church for a while to sort some things out. Katt, dearest, I am so sorry to hear of your recent hurts at the hands of God’s people. So, so sorry. Such a painful thing to happen, and so outside of God’s will for His church. And I am so sorry I haven’t been able to respond until now — our internet was out for a week. Now that I’m online again, I just want to say a prayer for you as you rest and heal from this church ordeal. I pray Jesus will be with you in the silence and solitude, and that He will bind up the wounds as only He can. I pray that He will knit your and your husband’s hearts together in an intimacy that reflects the love of the Father, the Son, and the Holy Spirit for us. Ministry can be very hard on a marriage, but right now we call on the One who created them both, to restore both. I would love to stay in touch sister to sister. I am really excited to shift my focus from doing things for church to chasing after God. I feel like I am meeting a whole new me.